Much has been made of two women named “Maria/Mariam” in the Talpiot tomb, whose names are preserved on the two ossuaries: CJO 701 (where Rahmani read Greek “Mariamene”), and CJO 706 (where he read Hebrew “Maria”). In each case, the identity of the named individual was put forth as absolutely essential for understanding the relationship between the tomb’s contents and the family of Jesus of Nazareth. 2) The central importance of the name Mariah, understood as “Mary (the mother of Jesus)”, for the producers of the film. Until now, we have not dealt much with the Hebrew name “MARIAH” found on ossuary CJO 706. However, the filmmakers made much of the name’s “rarity” among the ossuaries. They explained the name as a Latinized form of the Hebrew name MARIAM, written in Hebrew letters. “Throughout history, from the first Greek writings of Mark, the earliest Gospel, the ‘Virgin Mary’s’ name has come down to us in only one form, ‘Maria’. It is a Latinized version of the Hebrew, ‘Miriam’. “After Jesus’ death, Mary continued with his teachings and must have gathered a large following. In those times of religious transition, Roman converts also began to follow Jesus, and so as her popularity grew amongst his followers Mary’s name was Latinized. That’s why the New Testament records her name as ‘Maria’. Written in Hebrew, the name ‘Maria’ is very rare, but it’s exactly what was found on the ossuary in the Talpiot tomb. So, just how much of a problem is Maria? The production team asserted that the two Mary’s are critical pieces of evidence for their hypothesis. In response, a clear and and thorough analysis of the two ossuary inscriptions must be made to evaluate their claims. 1. CJO 701. We have treated the Greek MARIAME KAI MARA inscription in much detail over the past two months. We found that the names Mariamne (CJO 108) and Mariamene (CJO 701), as suggested by Rahmani, do not actually exist on those ossuaries. In both cases the inscriptions had been misread in the Catalogue, and in both cases MARIAME (the most common form of the name Mary among the ossuaries), should be read instead. See the article published on this website. 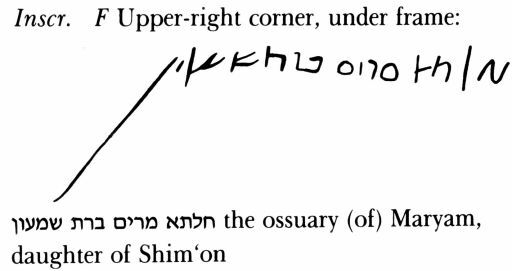 The index to CJO presents 6 ossuaries inscribed with the name “MRYM” (Miriam/Mariam) in Hebrew script: CJO 31, 243, 351, 502, 559, 821. The name is preserved on 1 ossuary at Dominus Flevit (No. 7). The index to CJO presents 3 ossuaries inscribed with the name “MRYH” (Mariah) in Hebrew: CJO 152, 706, 796. Dominus Flevit lists 2 ossuaries with this name (Nos. 7, 34). Therefore, an initial survey indicates the combined totals of CJO and Dominus Flevit as: 7 ossuaries with “MRYM” and 5 ossuaries with “MRYH.” However, this figure is incomplete for two reasons. First of all, the inscriptions on Dominus Flevit No. 7 refer to an individual woman who is called both Mariam and Maria. She is known by both forms of the name, which has been inscribed 3 times on the ossuary (twice as Mariam; once as Maria). Secondly, a close reading of all the inscribed ossuaries recorded in the CJO catalogue reveals a number of inaccuracies in the original readings, with the result that the census is actually reversed. Let’s survey the names provided by these sources. This was transcribed MARIAM by Rahmani. However, the final letter of the word on the right is a poorly written cursive he which is found elsewhere among the inscriptions (cf. CJO 353 “Hananiah”, CJO 801 “Yeho’ezar”; and Dominus Flevit Fig. 19 for several examples). The distinctive upper stroke of the letter rising above the ceiling line is characteristic of heh in this period, and is not found on the letter mem. Thus, it is far more likely that the inscription should be read “Mariah Yohana” rather than “Mariam Yohana”. Thus, of the 6 suggested readings of “MRYM” (Mariam/Miriam), 1 is actually “MRYH” (Maria) and 1 is actually “MRYN” (Marion), leaving us with 4 certain “MRYM”s in the index. In both cases, Rahmani has mistakenly read final “mem” as “samech.” However, samech in this period is more triangular in shape and does not have an extending line to the left, which is a characeristic of mem at this time (for samech, cf. Yardeni, Textbook of Aramaic, Hebrew and Nabataean Documentary Texts, Vol. B, p. 197; for mem, see p. 193). Two Mariam’s were removed (one as Mariah and one as Marion); two were added (both previously mistakenly read as Maris). Substituting the corrected reading of these two inscriptions for the two that were already corrected leaves the count at 7. But remember, one of the disqualified ossuaries must be added to the list of MARIA ossuaries, which now total 6. With still more evidence to come, “MARIAH” will move into a comfortable lead in tomorrow’s posting, so stay tuned.